Frederick is a German artist, one of the main representatives of romanticism. Like all other painters who gave preference to this genre, he put the personality at the forefront as something that could change the world, if not with his deeds, then with perception. As something intrinsic and priceless, as something that gives meaning to everything. 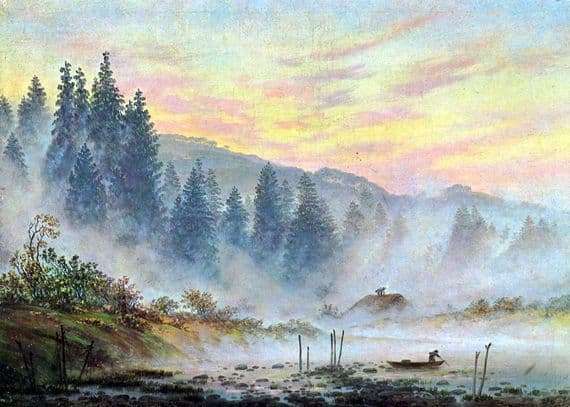 “Morning” is one of his classic works, where nature appears to the viewer in the flirty flair of light mist, in the sleepy bliss of early morning, painted with the tender blush of dawn. She looks like a young girl who has just woken up, charming and fresh, and even black sullen pines appear bluish, soft, thoughtfully tender in their own way. And, of course, there is a person in the landscape, although at first glance it may not be obvious. On the shore of the lake there is a fisherman’s house – a squat roof, a low pipe – it is so tight with fog that it is almost impossible to distinguish. In a small boat, a man rows to the shore – his figure gives off tension, he does not look at the beauty reigning around, completely absorbed in his work. However, even moving away from nature, without noticing her presence, he remains a part of her, harmoniously incorporated into the landscape. The waters of the lake around him are hidden in the fog, not even reflecting the sky, which is colored pink and gold. A tremulous pre-dawn hour reigns and, almost tangible, silence flows from the picture.